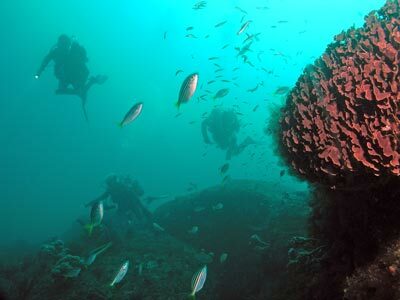 Michael McFadyen's Scuba Diving - Middle Ground The southern side of Sydney is blessed with so many dive sites, it is understandable that the dive charter operators do not visit them all. There are many spots off the Eastern Suburbs and Royal National Park sections of coastline that never get visited by dive charter operators. Some of these operators limit their diving to the same sites, week in, week out. However, with your own boat you can dive some spots that are not only as good as the spots they visit, but some that are much better. Some of these spots include Voodoo, Isolated Cemetery, the Pistol Crack and The Wanderers . Another of these sites, and possibly the best, is Middle Ground. This is located off Cronulla, straight out of Port Hacking. This site used to be dived in the 1960s but over the time it was "forgotten". However, in the early 1990s my friends and I started diving this spot, having noticed its location on a new Department of Public Works and Services seabed chart. Les Caterson, who used to own half of my boat, remembered diving it then and we found it without too much trouble. Les, who has been diving the coastline off Royal National Park since the 1950s, tells me that he used to dive this site back then but over the years people stopped visiting it. There are really two different, but fairly similar dive sites at Middle Ground. 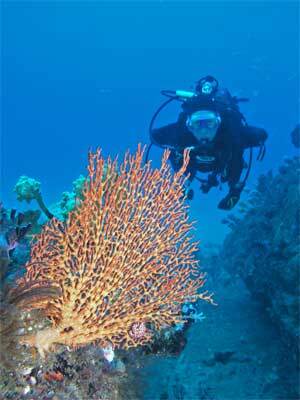 The first is a small dive site, an isolated reef only about 120 metres by 80 metres in size. On the northern and western edges it almost blends into the sand. However, the southern and eastern sides are more prominent with a good wall of up to three metres. Along the wall there are overhangs, cracks and some holes which attract good fishlife. The inside of the reef has many cracks that criss-cross it, poroviding small holes that can be explored. As far as I know, the only people who used to dive this exact site were those who came out on my boat, although other members of our dive club now do this site regularly. To the north-east of this site there is a bigger section of reef. This is perhaps 200 by 150 metres in size (or maybe more). This is the dive site that was only ever visited by the charter boat, Sea-tamer II (it no longer exists). Finding Middle Ground can sometimes be difficult as unless you run over the wall right on the south-east corner, it does not show up much on the depth sounder. The GPS mark for the site is 34° 04' 26.5"S 151° 11' 23.2"E. Note that all the GPS Readings on my Web Site are taken using AUS66 as the map datum. If you use another datum you may be about 220 metres off the wreck. See my GPS Page for more details and how to convert readings. This should put you on top of the reef and if you go to the south-east, you will cross the edge at the most prominent part of the wall. Use the attached marks to help and this will put you right on the wall. The top of the reef is 28 to 29 metres and the sand about 31 to 33 metres. The reef top is very flat and there are not a great deal of spots for your anchor to take hold so in southerly winds, drop anchor to the south of the wall. Also worth noting is the fact that there are two smaller reefs to the south of the main reef (although they can get covered with sand and disappear) that you can sometimes drag onto by mistake. When I say small, I really do mean small, as it only takes four minutes to examine and circumnavigate them. The larger reef is about 70 metres to the north-east of these reefs. Once you have anchored, descend and check your anchor. On occasions when the winds are up a bit (especially from the west or north) we have to leave on group or a non-diver on board as good anchor holds can be hard to find. The following is a description of Middle Ground. Once you are down, if you are on rock but cannot see the reef edge, swim due south until you strike the wall. The follow the wall to the east until it turns to the north. The reef edge here will be two metres high. There are a number of nooks and crannies to examine and the wall sort of zig-zags as it goes. Once you are heading north, there are some overahangs, including quite a large low cave that is home to large cuttlefish and wobbegong sharks. As you head north, off the eastern side there are a lot of very large boulders. These are well worth examining if you get the chance. Once you have done about seven minutes and before the reef edge turns to the west, turn around and follow the reef back south and west to where you crossed the reef edge. This should let you see the best parts of the wall. If time permits at the end of the dive, swim over the flat reef for a bit. There are lots of cracks in the reef. Owing to the depth, you will not have a huge bottom time, but you will have enough time to explore a good section of the reef. On subsequent dives here it is quite easy to swim right around the reef. It only takes about 10 minutes, even allowing for time to explore the many nooks and crannies. To do this, just follow the wall in one direction (I prefer doing it anti-clockwise as the wall is easier to follow, especially in poorer visibility). Eventually you will return to your starting point. However, I would not do it in very poor visibility as on the western side there are some rocks that you could accidentally follow. As the no-deco time on this dive (using an Aladin computer) is about 16 or 17 minutes, you can comfortably circumnavigate Middle Ground on your dive. As mentioned, on the south-eastern corner there are some large rocks which sit a few metres off the wall to the east. These are quite interesting to examine. The whole reef has parallel cracks running north-south. These vary in size from indents on the top of the reef to cracks you can swim down. You can follow any of these in the knowledge that it will take you to the opposite side of the reef. 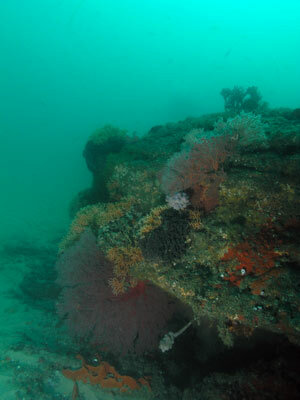 This site is an excellent site to see great sponges, sea squirts, gorgonias, sea whips, wandering anemones, swimming anemones, Port Jackson sharks, wobbegong sharks, eastern blue devilfish, red morwongs and numerous species of nudibranches. It also normally has amazing fishlife, huge schools of yellowtail, sweep, ladder-finned pomfret and seapike hovering over the reef, sometimes almost reaching to the surface. I have seen very large schools of kingfish swooping in around divers, half a dozen large bream moving metres over the reef and other amazing sites. In winter you used to be able to see dozens of wobbegongs but in more recent years they have been scarcer. In August there can be up to a hundred Port Jackson sharks on the one dive. 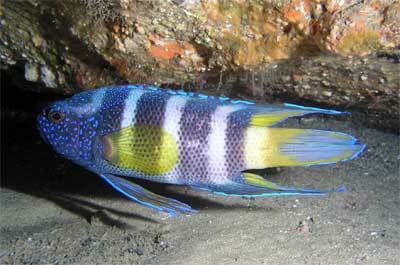 On one dive I saw the above as well as two eastern blue devilfish, two spiny gunards as well as a couple of numbrays. Wobbegongs are common most dives and eastern blue devils can be seen under some of the overhangs as well as giant cuttlefish (up to six on the one dive). There are quite a few sea whips on the rocks near the sand and these are often home to the beautiful wandering anemone which attach themselves to the whips and look like open flowers. They also harbor basket stars. There are a lot of serpent eels and sea pens living on the sand and I have even seen a sea horse on the wall and many times now we see pygmy pipehorses. As well, on one dive I found a stargazer on the sand between the large boulders on the eastern side. We have also had seals buzz us when on the bottom. In fact, since about 2002 we see seals about 60% of the dives here, either when we are underwater or on the boat. In July 2010 I saw a large loggerhead turtle here! Brilliant. Quite a few years ago I went on a dive off Royal National Park with Max Western on his (then boat) Sea-tamer II. Most of the other divers on the boat had dived Middle Ground earlier that morning and were doing a second dive. One of these divers told me that "it was the most boring dive I have ever done" and that he did not see anything. I found this amazing, considering the quality of my dives there, so I later sought out a friend who was on the same dive. He told me that it was one of the better dives he had done in Sydney. Who to believe? Well, as I knew the second diver (and saw how the first diver actually dived when we went on this second dive), I knew that my friend's opinion of the dive (as well as my own experiences) was right. This just shows that you must dive to suit the site. 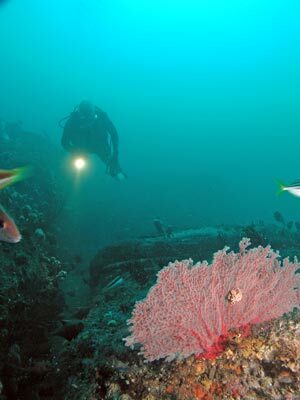 This is an excellent dive site, a place that you can experience the best diving Sydney has to offer. Visibility can be up to 25 or 30 metres but mostly 10 to 15 metres or so. In February 2001 I dived here two days in a row and we had visibility of 25 and 30 metres, together with huge numbers of fishlife. On 26 April 2013 we had similar visibility and fishlife. Fantastic dives!!! All aboard my boat on these dives, especially the second day, were of the view that this had been amongst the best dives that they had done in Sydney (and these people dive Sydney every weekend). Unfortunately there is no longer any dive charter boat operating out of Port Hacking (there used to be three), so unless you have your own boat, you cannot dive this brilliant site. Following is a short video of a seal we have seen many times during Spring 2011. This was taken 5 October 2011. The following video was taken on 20 May 2012.